If you’re going to garden organically around here, you’ve got to be tough—at least as tough as my friend Nancy, who confesses that the greatest pleasure of her summertime morning is to roam her dewy garden, waking up sleepy grasshoppers and flicking their heads off with her thumbnail. My own favorite approach to pest management involves smooshing soft-bodied aphids off the buds of my roses with my fingers. Makes me feel good. I like to carry a source of water in one hand, like a spray bottle or a hose, and wash the messy little corpses off the plants as I go. Another “handy” solution for a specific pest—the red spider mite—and one that involves less obvious mayhem, is the water spray alone. If you wash foliage down well enough, including the undersides of the leaves, you can rid your tomatoes and beans of the little monsters that are sucking them dry and turning them crisp. Some gardeners take this process a step further by using a pump-up sprayer and mixing four tablespoons of liquid seaweed into a gallon of water. If you like the smell of this elixir, you can wade into the fray, spraying with one hand and using the other to turn individual leaves topsy-turvy so you can scrub their backs. The control experts in my yard for heavy-duty pests, like grasshoppers and caterpillars, are the mockingbirds, wrens and robins that share it with me. These little meat-eating machines hoover up ants, spiders, wasps, beetles, worms, millipedes, snails and even little garden snakes. An extra bang to gardening organically is things like those little snakes. If you’re not killing off their prey with broad-spectrum chemicals before they can get to it, they’ll help you clean up. They catch grasshoppers, too, and they’ll eat them head and all. However, it’s not much fun to encounter one as you fumble around under the mulch with a hand, checking the soil moisture. My friend Sue once encountered a copperhead thusly. She snipped it in two with her loppers. She’s tougher than I am. Just accidentally dislodging a drowsy toad from soft soil with a trowel is enough to make me jump and yell. It startles the cat, too. Cats, by the way, can themselves become pests in the garden. They chase the birds and are as fond of that soft soil as the toads are. If there’s an area from which they must be barred, scatter about a physical deterrent, like the trimmings from your thorniest rose bush or the balls from a sweet gum tree. Cats won’t touch them. There are some things I just won’t touch, too, snails and slugs prominent among them. Happily, the old-fashioned trap formed by an inch of beer in the bottom of a tuna can or saucer deployed in beds obviates the need. Used persistently for about a week, it will rid the garden of these slimy pests. And I can get on with smooshing aphids. 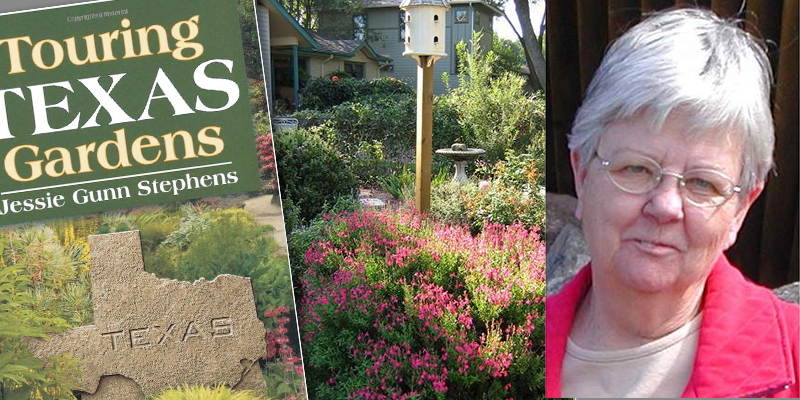 Jessie Gunn Stephens knows her Texoma gardens. An expert on what grows in North Texas, she is a Master Gardener and a prolific writer. Stephens has visited gardens all over the world. Her short stories and articles have appeared in many magazines and newspapers across the U.S. She lives and gardens in Sherman, with her husband, Tony.